Just like Janus (1), the Roman God of beginnings, Iranian politics seems to have two faces, one looking inward (the past) and the other outward (the future). Hashemi Rafsanji, the behind the scenes architect of the political rise of both Khamenei and Rouhani, took fire this week when he claimed that the founder of the Islamic Republic had agreed to remove the slogan of "Death to America" years ago (3,4). He claims It was during the era when "Death to Russia" slogan fell out of favor. "The Institute for Compilation and Publication of Imam Khomeini's Works" did not refute Rafsanjani's comments, except to say that Khomeini only applied to the use of the slogan by the media, not the people. This foundation is not exactly the darling of hard liners in Iran as reformists often use the words of Khomeini to make their points, assuming that if they quote Khomeini they are less likely to be hanged. 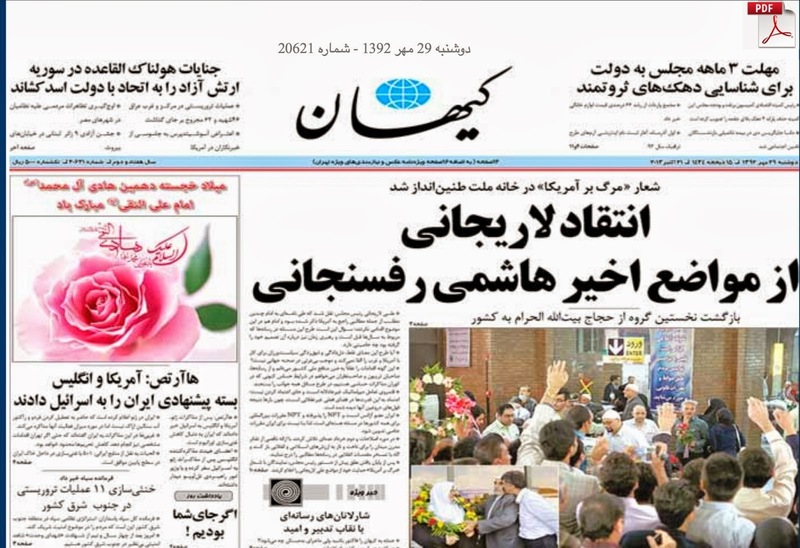 With the usual Persian convolution, the hard liners indirectly called Rafsanjani a liar for trying to use the founding father's words to rob them of the "Death to America" slogan. 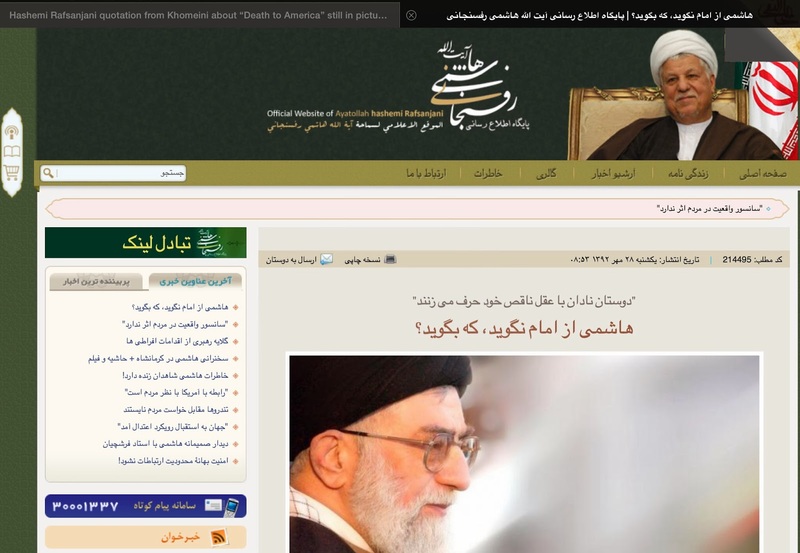 Instead of engaging in direct debate, Rafsanji countered by posting a Khameni quote on his web page in which he declares "If Rafsanjani can't quote the Imam (Khomeni), then who could". This quote was offered a while back and in a different context, but that didn't stop Rafsanji from using it for effect. 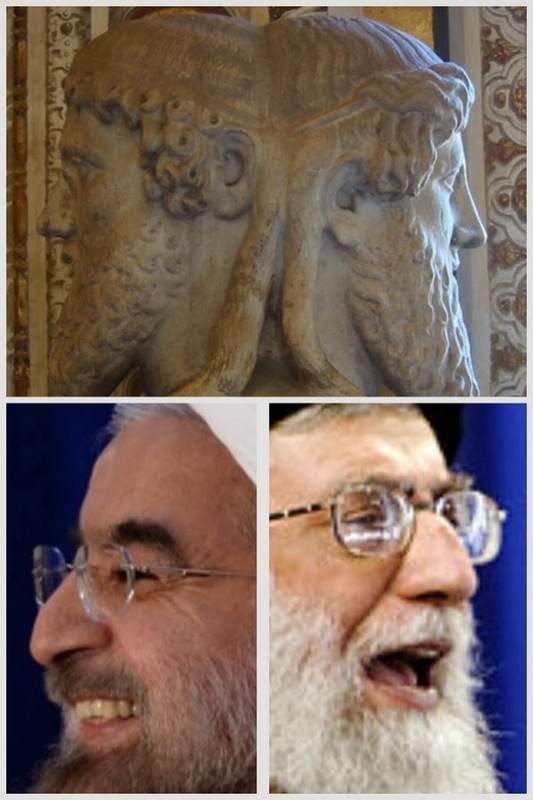 As Rouhani leaps forward, his surrogates (i.e. Rafsanjani et al) are battling Khamenei's surrogates (i.e. Keyhan, IRGC, Friday Prayer Leaders, Judiciary, Majlis) within Iran to lay the ground work for normalization of relations with the USA. Naturally both Rouhani and Khamenei are completely silent on the "Death to America" issue this week. Khamenei's last comment was in 2006 (6). One can imagine that the next taboo to be tackled will be the turning over the occupied embassy back to the US and painting over the anti-American murals. One day, there might even allow the state media to show a photo of a handshake between the US and Iranian officials. A speech by Obama in Azadi square is too much to envision. Slogans, Or A Turning Point?! The battle over the slogans goes beyond symbolism and history. The real disaster for the regime is that once they stop saying "Death to America" they would have to say something else, like answering for their record of governing for over 30 years. If all the suffering of Iranians today is not depicted as the US's fault, then, god forbid, Khamenei himself may be blamed. Iran has billions of petrodollars in escrow accounts in various countries that it can not repatriate due to banking sanctions. If these billions are returned, the IR would have the money to triple its budget for a few years. The return of this hard currency to Iran in the near future maybe the only reason Rouhani and his foreign minister are being given a little slack by the supreme leader and the IRGC. Failure to secure this money, as a first step in negotiations, will likely spell the end of Rouhani's political honeymoon. 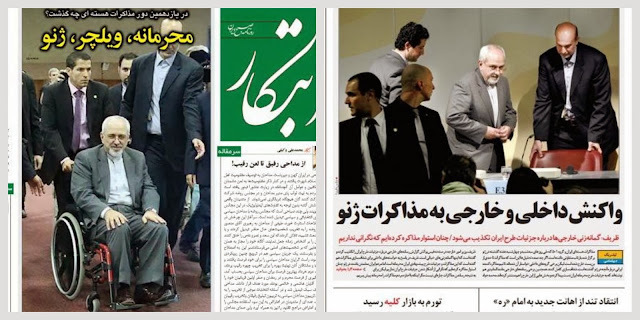 The foreign Minister who spent years in the US and has American children (by birth), is doing his best to accomplish the Rouhani diplomatic mission, but even he could not resist the stereotypical urge to play the victim card, as he used a wheelchair to get to the recent Geneva meeting, only to stand and take his seat at the table once there. I guess his point was that he made it to the meeting despite his back pain. Instead of sympathy, he probably reminded the western delegates of the manipulative and deceitful nature of the IR foreign policy--Janus comes to mind again. 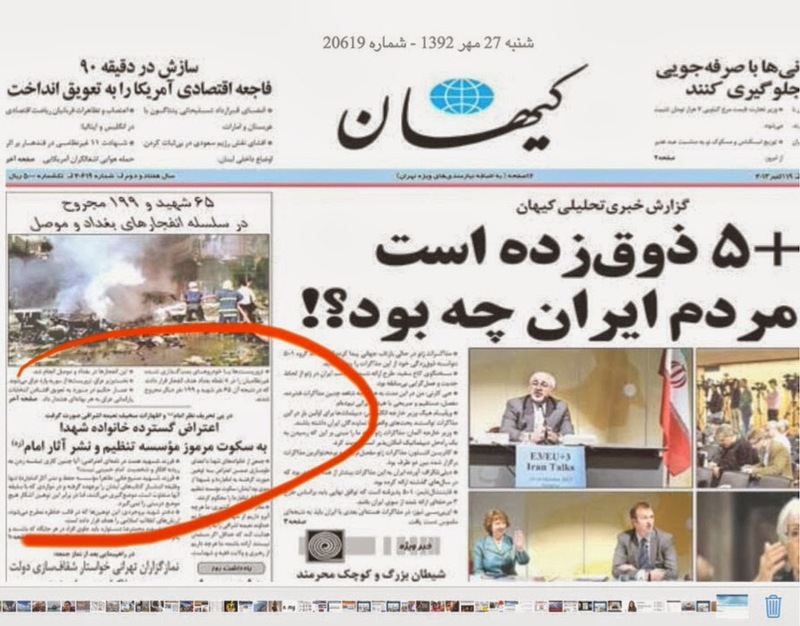 (3)IRGC rejects Hashemi's claim that Khomeni was in agreement to remove the slogan "Death to America"
"As President Rouhani and his foreign Minister sprint ahead to normalize relations with the United States"
Every "state event"? That's not true. I've noticed Jabbar you're fond of using footnotes but when it comes to false assertions such as these, there usually no footnote. Now you might say "frequent" but that's different than "every". That said, I'll be very happy when these slogans are no longer used, and IRGC-GF MBTs no longer roll their tracks over representations of Old Glory in military parades. I'm sure you've been to more islamic republic state events than anyone here. Next time try yelling allaho-akbar next to a few basjis and see what happens.